What if I disagree with the decision reached in the final order? How much time do I have to appeal to superior court? In what county do I file a superior court appeal? Do I need to send copies of the appeal to anyone? Is there a form for filing an appeal in superior court? What evidence will the superior court consider? 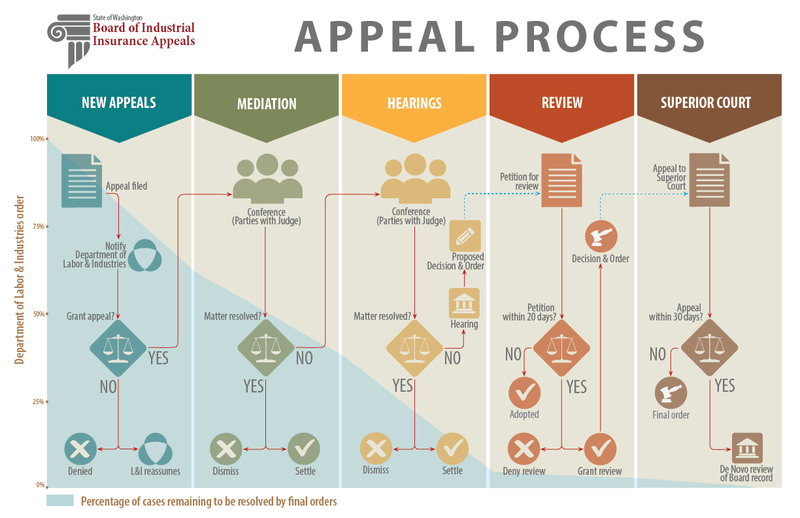 Where do I find the rules about superior court appeals? Any party who disagrees with any portion of this decision may appeal to superior court. In workers' compensation and WISHA cases, your appeal to superior court must be filed within 30 days from the date you receive the Board's final order. In crime victim and employer premium cases, your appeal must be filed within 30 days from the date the order was mailed to you. In a workers' compensation case, file the appeal either (1) in the county where the injured worker or beneficiary lives, or (2) in the county where the injury took place. If the worker's residence and the place of injury are outside Washington State, file the appeal in Thurston County Superior Court. In a WISHA case, file the appeal in the county where the alleged violation occurred. In a crime victim or employer premium case, file the appeal either (1) in Thurston County, (2) in the county where you live or where your principal place of business is located, or (3) in any county where the property owned by the petitioner and affected by the contested decision is located. No. Each superior court has its own filing requirements. There is a directory available on the Washington Courts website to help you locate the appropriate superior court. The case will be tried based on the record made before the BIIA. The record consists of transcripts, depositions, and exhibits offered during Board hearings. Statutes and rules can be found in the Revised Code of Washington (RCW) and Washington Administrative Code (WAC). These are legal publications available in law libraries. They are also available on the Washington State Legislature website. Most of these rules can be found in the Board's Rules of Practice and Procedure. Workers' Compensation – See RCW Chapter 51.52 and WAC 263-12-170. Washington Industrial Safety and Health Act (WISHA) – See RCW 49.17.150. Employer Premium – See RCW 51.48.131, RCW 51.52.112, and RCW 34.05.510 – RCW 34.05.598. Crime Victims – See RCW 7.68.110 and RCW 34.05.510 – RCW 34.05.598.